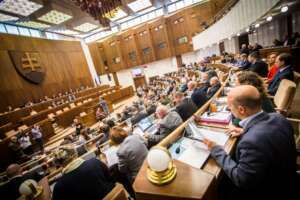 The Slovak parliament SAYs NO TO EXPENSIVE BUSINESS TRIPS. Thanks to our VIDEOCONFERENCING SYSTEM. Modern communication solutions are already used by many organizations. This year also National Council of the Slovak Republic (NCSR) has joined and with the new video conference system they expanded the possibilities of effective communication. Soitron supplied NCSR with a modern video conference system which is now located in a representative meeting room. The video conference room, which was originally an ordinary meeting room, is now equipped with monitors and a third presenter track, which can recognize and watch the current speaker. NCSR sought a solution that would facilitate communication with local and foreign institutions. Thanks to the video employees can now connect for example with the European Commission at any time and without having to travel abroad. Apart from the time devoted to business trips, the costs associated with negotiating abroad will also be significantly reduced.